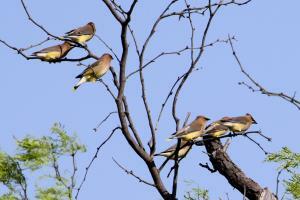 Saw two large flocks (20 - 30 birds per flock) of Cedar Waxwings today - the first of the year! Temp started at 65, ended at 75. Sunny with strong, steady winds. Leisurely hike on the major South Shore trails. Bird activity pretty high - saw this year's first Cedar Waxwings at two different locations, lots of birds singing for mates and a few of the Lace Cactus have blooms while others do not. Trails are dry, visible and easy to traverse; some trash was found but not much. Overall, this was an easy hike on a beautiful Spring day. A small group of Cedar Waxwings.